Prepare to smile, laugh, feel good, applaud, and appreciate an uplifting story sung and danced into your heart by a strong, beautiful, coordinated cast. Get ready for a perfect production of a archetypal feel-good big musical. Beyond the summary above, everything else is just dreary supporting detail. The story has a socially marginalized fat girl scoring a position on a TV dance show that is a bastion of white privilege and teenage snottiness. She and her black friends break barriers and win the hearts of the hottest boys… and of the audience. Ensemble. Photo by Jenny Graham, Oregon Shakespeare Festival. This OSF musical entertains, explains, and engages flawlessly. Director Christopher Liam Moore has created a unified, lively show that is excellent fun. Friends who have seen many productions, including on Broadway, said that this production was the best they’ve seen. Everyone in the cast shines. I am especially happy to see veteran and returning Ashland actors sing and dance so well. 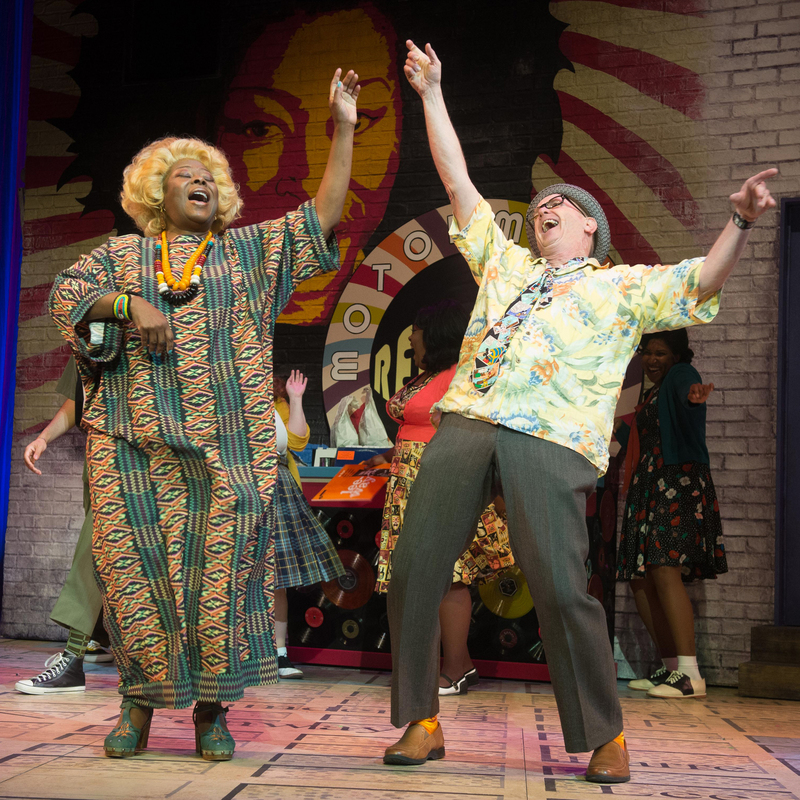 Greta Oglesby (Motormouth Maybelle) is back!… in a moving, show-stopping way. We know the strong talent of Jonathan Luke Stevens (Link Larkin) and Eddy Lopez (Corny Collins) from large musical roles in prior years. And, K.T. Vogt (Prudy Pingleton), Daniel Parker (Edna Turnblad), Brent Hinckley (Harriman F. Spritzer), Chritian Bufford (Seaweed Stubbs), and David Kelly (Wilbur Turnblad) have been characters in earlier OSF musical productions — some of them meaty. Did I know that Kate Mulligan (Velma) has so much musical talent? I do now. Greta Oglesby (Motormouth Maybelle) and David Kelly (Wilbur Turnblad). The new-to-OSF performers are also incredibly talented. My favorite, no surprise, is Katy Geraghty (Tracy Turnblad) who amazes with her hot, heavy moves. She amply fills the starring role! 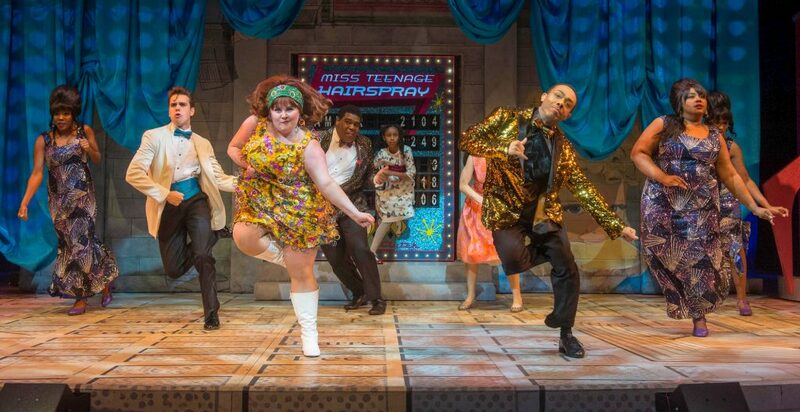 All-in-all Hairspray is a flawless, feel-good musical romp. I have no suggestions for improvement — I believe OSF’s production delivers everything possible from the show! Now, I don’t think you leave the theater changed. The “everyone’s included in our dance party” feels uplifting, but it’s mainstream snowflake propaganda that doesn’t deliver any revelations. Hairspray is a musical version of Green Book — a white-written, cross-racial, happy buddy story. Still, the OSF production fulfills all the promises of the show. The writing, music, and execution are definitely on the top of the happy-musical genre. Everyone leaves the theater cherry, signing, and smiling. Hairspray deserves its standing ovation. This entry was posted in osf, plays and tagged 5 stars, Hairspray, HairsprayOSF, musical, Oregon Shakespeare Festival, OSF. Bookmark the permalink.